SAN FRANCISCO -- X has arrived and it's an appliance. Hyped and kept under wraps for months and promoted here with banners proclaiming, "The X is coming," Oracle CEO Larry Ellison unveiled his company's foray into hardware during a keynote at Oracle OpenWorld. The result of three years of development with HP, Oracle revealed the Exadata product line, which includes the HP Oracle Database machine and HP Oracle Exadata Storage Servers. "We really need much more performance out of our databases than we currently get," Ellison said. "Information is proliferating at an astonishingly high rate. The disk storage system available today simply cannot cope with data that has to move. Large databases are tripling in size every two to three years. That creates a fundamental problem. They can't move that data off the disks fast enough." The result is a "data bandwidth problem" moving data between the storage arrays and database servers. The answer, according to Ellison, is either to reduce the amount of data moving between the storage system and the database servers or to build wider, faster pipes and more of them. Oracle and HP have done both, he said. The Exadata programmable storage server includes two Intel processors, each with four cores, with up to 12 terabytes of raw storage. "We've taken our database capability and moved it right into the storage server and next to every disk drive," Ellison said. "That intelligence allows us to reduce the amount of data that flows across that interconnect." Traditional storage arrays must transfer every disk block if there is a missing table. For example, when asked to determine yesterday's sales on a table, when there is no index for the data, the storage array has to transfer every disk block to the database server. "What happens when we have the smart storage server is [that] we actually pass the query from the database server into the storage server," Ellison said. "That query goes to each of those servers and we search all of those disk drives in parallel." Additionally, Oracle also built bigger pipes. Two Infiniband 20 gigabyte pipes can move one gigabyte per second. Customers can run multiple Exadata storage servers in parallel. The Exadata storage grid works with any Oracle database server and is immediately available for Linux database servers. Other operating systems and chip architectures are being developed, Ellison said. Oracle's partnership and development contrasts with database challenger Microsoft, which in July acquired data warehouse appliance vendor DATAllegro. With a storage server product in hand, Oracle and HP put several technologies together in a box creating what Ellison called "the world's fastest database machine." The Exadata Database Machine, which rose out of the stage from below Ellison amidst a cloud of smoke, features eight database servers with 64 Intel processor cores, Oracle Enterprise Linux and a grid of 14 Exadata Storage Servers that include up to 168 terabytes of raw storage. "Importantly, it holds a really lot of songs," Ellison quipped. "This is 1,400 times larger than Apple's largest iPod." Beta customers have been testing the product for the past year on large systems and boast increased speeds ranging from 10x to 72x, Ellison said. Competitor Teradata has a sophisticated database, but it moves disk blocks into a disk array and its interconnect is slow, Ellison said. Netezza meanwhile, offers better bandwidth but has one storage server per disk drive and loads only twice as fast as the Exadata product. "Two big differences: Our database machine runs Oracle; their database machine does not," Ellison said. "We lose a disk drive, our machine keeps running. They lose a disk drive, their queries stop. Their overall database ability is really primitive." Netezza was quick to respond, issuing a statement shortly after Ellison's keynote ended. "For years the old, incumbent vendors have tried to bolt together their products to try and tackle the data warehouse appliance market -- and every one was a failure," Jim Baum, president and COO, said in the statement. "You just can't slap together existing solutions in clever packaging and expect to deliver much faster performance. The power and simplicity of the data warehouse appliance model lies in the integration and design from the ground up. Engineers in the same company, the same building, working to integrate a shared vision -- not patch it together with glue and spit." "I thought Larry's presentation was excellent," said Mike Balint, a senior DBA attending the conference. "I like the way he downplayed the strengths of the product -- that it's Oracle software and HP hardware with HP service, which is second to none." Balint's company has an order in for four 4CPU processors from IBM. "We could cancel that whole order and replace it with this and get more," said Balint, who asked his company name be withheld because of a relationship with IBM. "Oracle did not disappoint -- and, in fact, the software giant demonstrated that it can now scale its DW/DBMS platform to address the petabyte-scale analytics requirements that will soon come into the enterprise mainstream everywhere," James Kobelius, an analyst with Cambridge, Mass.-based Forrester Research Inc., wrote in his blog.. "For Oracle's positioning in the DW market, this new product is a bold move into petabyte scale-out territory, an emerging, very high-end niche in which one veteran vendor, Teradata, has been preeminent (though, in fact, most real-world enterprise [data warehouses] barely go beyond 10 TB to 15 TB, for which Oracle's existing DBMS/DW stack, which can push into the 100s of TBs, is more than sufficient)." 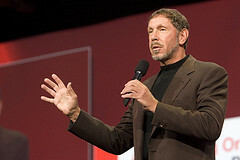 Oracle's sales force will sell the database machine, and HP will build and develop them.